The month of September is often a time of optimism in the National Hockey League’s 31 markets, as training camps open and the possibilities of a brand-new season are still on the horizon. In Calgary the mood has instead been a bit uneasy as the tense negotiations for a new arena between the Flames and the municipal government have become public and, somehow, even more tense. To many, the two sides seem even further apart than ever, with each side seemingly dug into their particular position with no intention of budging in a proverbial game of chicken with huge implications. The Scotiabank Saddledome opened in the fall of 1983 and is about to begin its 34th season as home of the Flames. Given the facility’s age and that the majority of the other NHL clubs play in newer arenas, the Flames have been working on plans for a new home for awhile. They began work quietly around 2007, then kicked plans into gear after the June 2013 flood that submerged the Saddledome up to the 10th row of seating. Those plans culminated in the Aug. 2015 unveiling of the CalgaryNEXT project for the downtown West Village and a series of resultant concerns, primarily from City Council, regarding the scope, cost (over $1 billion), and funding model. After a great deal of public (and private) back and forth, the Flames reportedly warmed to the City’s idea for an arena in Victoria Park and discussions progressed to the point where Nenshi admitted that the municipal government felt a deal was close. Mayor Nenshi released a campaign video on the morning of Sept. 11, outlining plans for a cultural and entertainment district in Victoria Park, including an arena. Flames president Ken King announced on Sept. 12, at a hastily-called press conference during the team’s golf tournament, that the team was no longer going to negotiate for a new building and would continue on in the market as long as they could. The City of Calgary released their latest offer on Sept. 15, with Mayor Nenshi (flanked by several members of council) presenting the proposal and answering media questions. King responded with a press conference of his own later that day, refuting several details of the City’s presentation. The Flames released details of their last proposal in a media release and ads in both local papers on Sept. 21, details of which Nenshi refuted when speaking to the media later that day. Costing out the Victoria Park arena at $555 million – including demolition of the Saddledome – the municipal government’s latest offer is a three-way split of the costs ($185 million each) between the hockey team, the City and a ticket tax. The public contribution to the arena would be paid back by a mechanism Nenshi was vague about, but speculated it could be rent, property tax or another way – he noted the topic was still up for negotiation. The value of building an arena in Victoria Park, to the municipal government, would be cementing the Flames’ placement in town for several decades and providing an anchor development for a proposed cultural and entertainment district – an extension of the recent development of the East Village area north of Victoria Park. 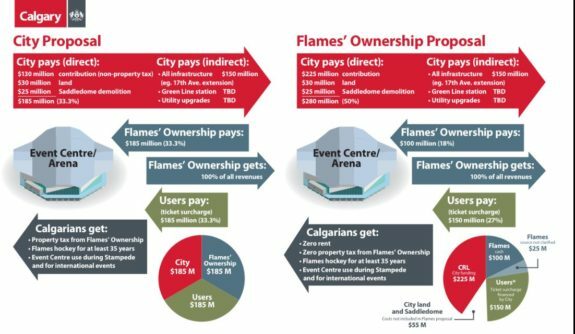 Costing out the arena at $500 million, the Flames’ offer includes $275 million of support from the team and $225 funded by the City through a Community Revitalization Levy – the arena site would fall within the Rivers District CRL area. The club’s costing of the arena excludes $25 million that the city included for the Saddledome’s demolition and a $30 million valuation of the land the building would be on, part of a land-swap between the Flames and the Stampede Board, which King dismissed as an accounting move. Nenshi responded to the proposal the following day, noting that CRL funding was already allocated and that the program was under review by the provincial government – making it very difficult to get another one or even extend the existing funding window. A graphic put out by the City of Calgary pointed out most of the points of disagreement between the two sides, but also a few interesting areas of agreement. Both agree that the Flames would receive 100% of the revenues from the building and operate it, as they have with the Saddledome since 1994 (aside from an annual donation to three local charities currently in the vicinity of $1.8 million). Both agree on the scale and placement of the development, the Flames grudgingly accepting the City’s suggested placement of Victoria Park, with the price tag coming in at around $500 million. Both sides agree that the Flames would be committed to the building for at least 35 years and that the building would be utilized in annual events (such as the Stampede) and international events (such as potentially the 2026 Olympics). Presumably the Flames would be on the hook for maintaining the building, as they do with the aging Saddledome. The list of disagreements, however, is lengthy. Would the Flames pay rent or property tax, and if so would that payment diminish any party’s share in the capital costs of the building? Who would borrow the money to cover the ticket tax revenue during construction? Would ticket tax revenue count as part of the Flames’ contribution or be otherwise allocated? How much say would the Flames get in the redevelopment of the surrounding Victoria Park area? In recent weeks, King has been critical of the mayor, but has backed away from taking an overt political stance in the run-up to the Oct. 16 municipal election. However, NHL commissioner Gary Bettman alluded to “consequences” of the lack of a new arena in speaking to the media following King’s announcement and subsequently pointed the finger at Nenshi for why the building wasn’t getting built. While the Flames are hesitant on taking a political stance, it seems that the commissioner isn’t as much. The 34th season of Flames hockey at the Saddledome begins on Oct. 7 with a visit fro the Winnipeg Jets. Nine days later, on Oct. 16, Calgarians go to the polls to elect their mayor and city council. Nenshi, the incumbent, has faced eroding popularity in part due to the declining economic climate, but is expected to likely win a third term. Presuming that the composition and viewpoints of Calgary’s council doesn’t change dramatically, it seems likely that both sides will eventually slink back to the bargaining table as the Flames season chugs along. Both sides, the politicians and the hockey club, proclaim they would like to build a new home for the Flames. Neither wishes to see the team leave town. But the devil, as they say, is in the details. For now, there’s equal parts stubbornness and bluster on both sides.